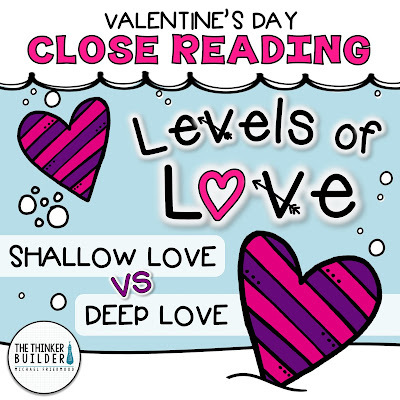 Valentine's Day is coming up, and one of my favorite reading activities to pair with the holiday is something I call "Levels of Love." 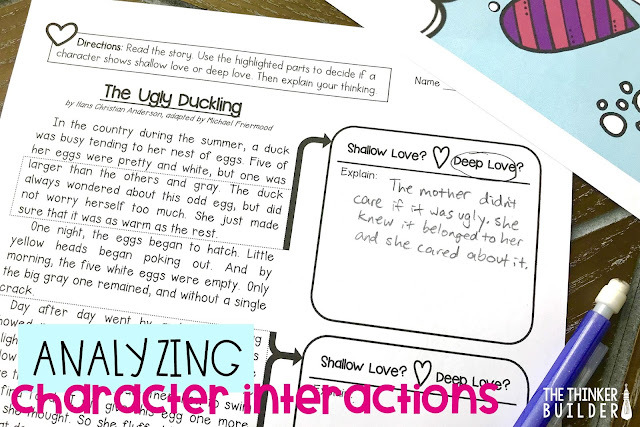 It's a close reading lesson that digs deep into character interactions. 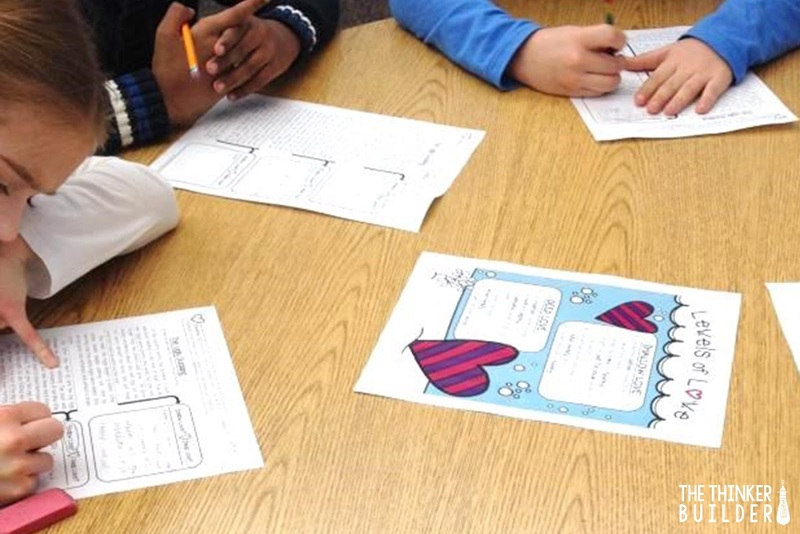 I start by gathering students around and I tell them we're going to talk about love. I play up the awkwardness a bit, let my vague "L-word" introduction draw out for a moment. But soon I lean in and we get down to business. We start an anchor chart, where I divide "love" into two categories: shallow love and deep love. Together, we identify characteristics of what shallow love looks like and what deep love looks like. For example, shallow love is often selfish or short-lived, or based solely on appearances. But deep love is genuine, lasting, and more about inner beauty. This is an important step, so we spend some quality time forming our anchor chart. Next I pull out a couple of recent read alouds to show students a few good examples, especially of deep love. For instance, from Shiloh, we talk about Marty's love for Shiloh, how we know it was so deep because he was willing to do anything for that dog. After students have a few good anchor examples of love being shown, be it shallow or deep, between characters in texts we've read previously, we settle down to read a copy of The Ugly Duckling. In close-reading style, I first read the whole story aloud to the class so that we all have a common understanding of the main events. 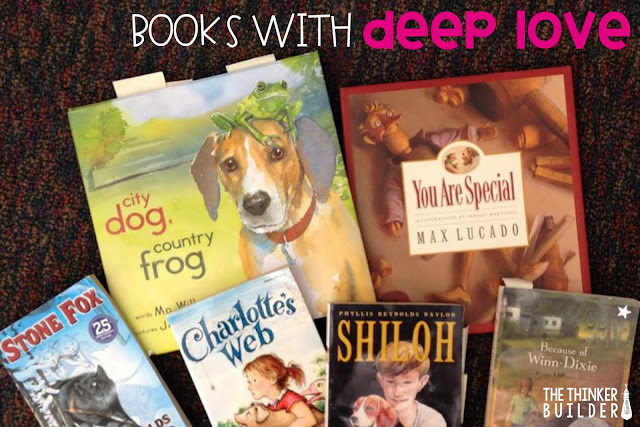 Then we go back and pull out certain pieces of the text to reread with the lesson's main purpose in mind: we use these excerpts to analyze the relationships and interactions between characters. 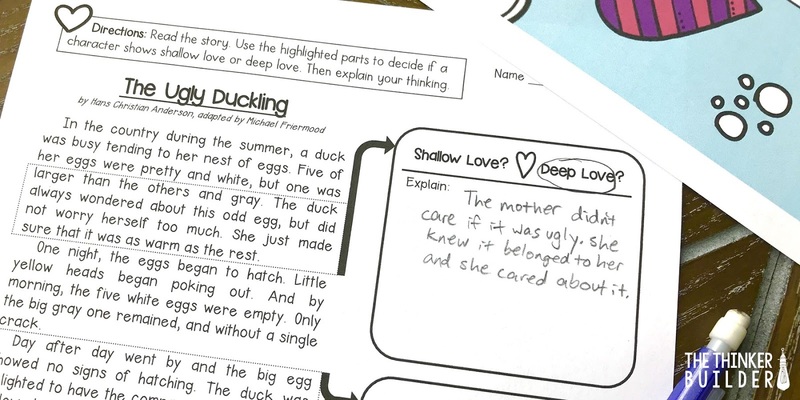 In this case, the excerpts focus on the mother duck and her ugly duckling. 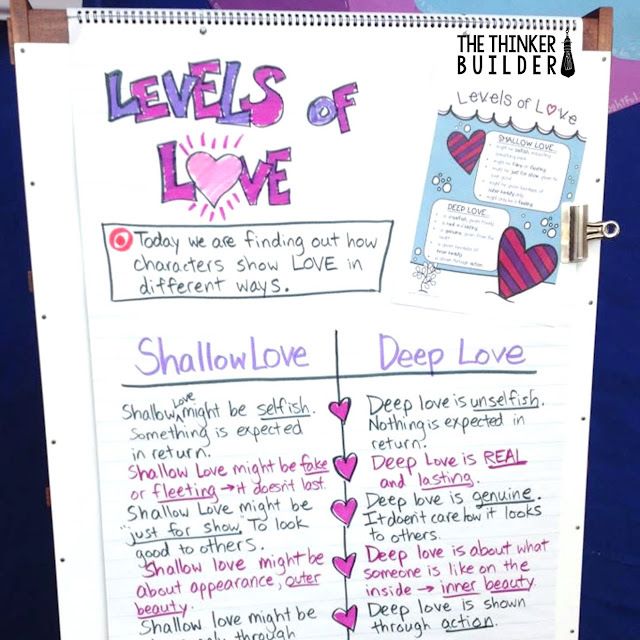 We use our anchor chart for reference to interpret the characters' actions and words as examples of either shallow love or deep love. With the excerpts we pick out, what's interesting is students often interpret the "love situations" differently; some see shallow love, while others see deep love. For example, when the story tells us the mother duck waits and waits for the last egg to hatch, many view that as an example of deep love. But others see it as shallow love, since the mother duck says she'll only wait one more day for the egg to hatch. These students see the mother basically giving up on the egg. These situations lead to dynamic, sometimes heated, text-based discussions, and I looooove it. After hashing out our thoughts, students record their thinking in writing. The next day, we extend our "Levels of Love" into one more story, The Frog Prince. 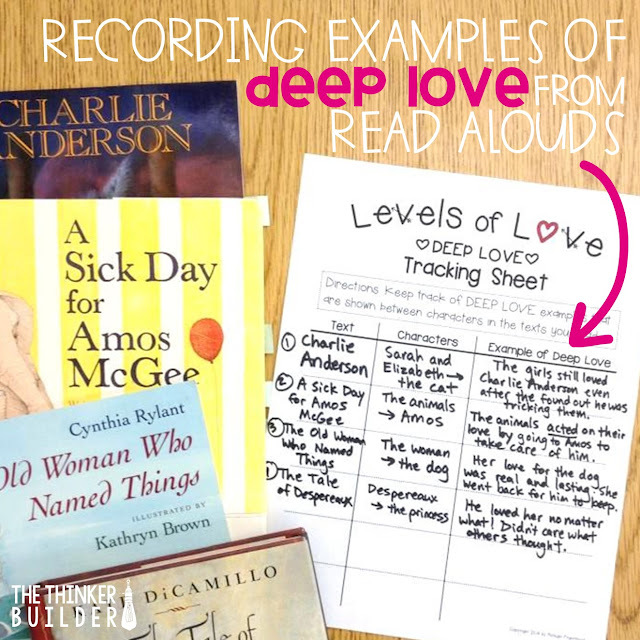 Again, I read the story aloud to the class first, but then I scaffold back my involvement, allowing students to reread and record their "love analyses" on their own. Since these interactions between characters, where love is the focus, need not be restricted to Valentine's Day, we start tracking great examples of Deep Love that we find in other stories we read. You can grab the free Tracking Sheet shown in the photo above right HERE! 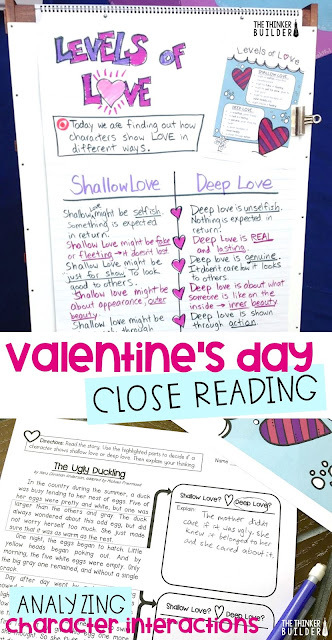 And you can get all the plans, anchor chart poster, passages, note-taking forms, and tracking sheet from this lesson from my TpT store right HERE, or click the image below. It's fun to see students get so invested in a lesson, especially one that started out with giggles and eye rolls from the "tough boys." By the end, some of those same boys are the ones telling the class just how deep a mother duck's love can be for an ugly little duckling.